On the night Leon Spencer Court was dedicated, the Lady Cardinals and Cardinals swept a doubleheader against Tyler. The Lady Cardinals were an 86-45 winner and the Cardinals took a 64-57 decision. The win improved the Lady Cardinals to 24-1 on the year and 11-0 in conference. The Cardinals raised their records to 16-9 and 7-7. Shannon Smith led the Lady Cardinals with 20 points. Adut Bulgak had 15, Roddricka Patton and Savannah Carter 13 each and Victoria Wells 11. Krystle Henderson added eight. The Cardinals were led by Tyler Corley’s 17 points. Karon Phillips had 10 and Carl Porter nine. Both teams are scheduled to be in action again Wednesday at Kilgore. Action begins at 5:30 p.m. The Lady Cardinals went 3-3 in the Cow Town Tournament in Fort Worth over the weekend to move their season record to 5-4. In action Friday, the Lady Cardinals fell to Cowley, 12-3, and Butler, 10-3, and defeated Cisco, 10-1. Saturday, they defeated Western Oklahoma, 5-4, and Odessa, 3-2, and lost to Weatherford, 9-7. The Lady Cardinals had 53 hits during the tournament. The Lady Cardinals are scheduled to be back in action Tuesday in Waco against McLennan. Doubleheader action begins at 1 p.m. The Lady Cardinals are scheduled to be at home Saturday against Grayson in their home opener. Doubleheader action starts at 1 p.m. They will also be at home on Saturday, playing Grambling State in two games starting at 1 p.m.
Palestine radio station KYYK (98.3 FM) will broadcast both TVCC-Kilgore basketball games Wednesday. The games will also be streamed online at www.youreasttexas.com. 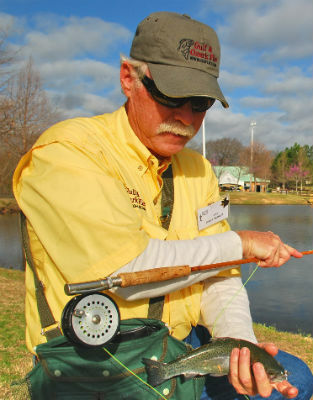 Pregame programming starts at 5:20 p.m.
ATHENS—Fly Fish Texas returns to the Texas Freshwater Fisheries Center March 9 with the goal of teaching visitors to tie a fly, cast a fly and catch a fish with it all in one day. Show hours are 9 a.m. to 4 p.m. All Fly Fish Texas activities are free with regular paid admission to the center. Fly Fish Texas emphasizes hands-on learning and immediate application of newly acquired skills. Visitors can collect aquatic insects from the center’s streams, tie a fly to imitate one of those insects under the supervision of a skilled tier, learn to cast it from a casting instructor certified by the Federation of Fly Fishers, then use it to catch a rainbow trout, catfish or sunfish from one of TFFC’s stocked ponds or streams. Throughout the day, experienced fly-tiers will be demonstrating and teaching fly-tying in the Anglers Pavilion on a one-on-one basis. In addition, group instruction in beginning fly-tying will be offered in the Hart-Morris Conservation Center. Both are offered on a walk-up basis. Beginning casting instruction will take place all day in the Conservation Center parking lot, again on a walk-up basis. Other sessions will teach single-hand and Spey rod casting at scheduled times. Vendors will be displaying and selling fly-fishing gear, and seminars will brief visitors on where and how to fly-fish in Texas fresh and salt waters for a variety of species. Featured presentations include fly-fishing the Llano River in Texas, trout fishing in Colorado, fly-fishing urban creeks in the Dallas/Fort Worth Metroplex, fly-fishing for carp, flies and tactics for spring bass and fly-fishing Texas bays for red drum and speckled seatrout. While most activities at Fly Fish Texas are offered on a walk-up basis, others are scheduled. For a complete schedule of activities and seminars plus a video of the event, visit www.tpwd.state.tx.us/tffc and click on the Fly Fish Texas link. Food service will be available onsite, or attendees may bring a picnic. Event sponsors include Sabine River Authority, Best Western-Royal Mountain Inn, Holiday Inn Express-Athens, Super 8-Athens, Temple Fork Outfitters, Orvis-Dallas, Cripple Creek Bar-B-Que, First State Bank, Red Hat Rentals, Wulf Outdoor Sports and Friends of TFFC. It’s time to rodeo up! 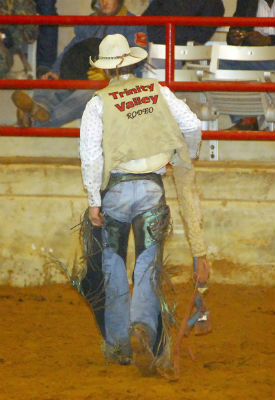 The 5th annual Trinity Valley Community College National Intercollegiate Rodeo Association-sanctioned rodeo is scheduled Friday and Saturday at the Henderson County Fair Park Complex. Competition is scheduled at 7:30 each night with slack beginning at noon Friday and 11 a.m. Saturday. Each night during the performance, children can compete in a calf scramble to win prizes. TVCC rodeo coach Brent Bratton said approximately 400 contestants, representing 20 college and universities, are expected to compete. Expected to compete with Bratton’s talented squad are Hill College, Southwest Texas Junior College, McNeese State University, Northeast Texas Community College, Lone Star Community College – Montgomery, Panola Junior College, Texas A&M University, Sam Houston State University, Stephen F. Austin State University, Texas A&M University – Kingsville, and Wharton County Junior College. Each NIRA member college has its own club composed of student members and sponsored by a faculty advisor who supervises the club’s activities. Each year, a men’s team consisting of six members and a four-member women’s team is chosen from each school. These team members travel to the regional rodeos competing against other NIRA member schools. Those not chosen for the team may compete on an individual basis and still be eligible for all prizes except those given to the team. The top three contestants in each event from each of the NIRA’s 11 regions qualify to compete in the CNFR. The top two men’s teams and women’s teams also qualify from the regions. The TVCC roping team of Wenceslao “Lightning” Aguilera and Kolby “Thunder” Miller is currently ranked No. 1 in the region. General admission tickets are $5 each and may be purchased in advance at Lone Star Western Wear in Athens, or on the night of the performance at the gate. All proceeds generated by the rodeo are given back to the students to further their education, according to Bratton. Sponsors of the 2013 event include: Henderson County Farm Bureau, Holiday Inn Express, Best Western Royal Mountain Inn, Athens Bank, Kevin Lilly’s McDonald’s, Champion Genetics, Miars Arabians, Whataburger, Bent Bucket Ministries, Smith Pro Rodeo, Carr Pro Rodeo, ETMC EMS, Southside Feed, North 19 Fire & Rescue, Reynolds New York Store, Ag-Power, Inc., Trinity Valley Electric Cooperative, KCKL 95.9FM, Red Line Power, Citizens National Bank, Lone Star Western Wear, Mark Roberts, DDS, Marion’s Shell & Service Center, Heritage Land Bank, Dillon Manufacturing, Agri-Land Farm Credit Services, Athens Cleaners, Mill’s Feed & Supply, First State Bank, Bar None Cowboy Church, Jalapeno Tree, Prosperity Bank, Big Tom Construction, Athens Lumber & Supply, Spencer Hardware, East Texas Ag Services, Henderson County Veterinary Hospital, Citizens State Bank, Cox Trailers, Iron Hill Ranch, McMurray’s Signs, East Texas Crushed Rock, Palmer Trucking and The Cutting Company. The Lady Cardinals are off to a 3-1 start. Coach Ashley Johnston’s squad, which has been a regional tournament qualifier the past two seasons, opened Friday with a sweep against Grayson College, winning 7-5 and 7-1. Saturday, the Lady Cardinals split a pair against North Central Texas College, dropping an 8-6 decision in Game 1 and prevailing 6-5 in Game 2. In the first game against Grayson, Chantelle Whitehead went 3-for-4, including a two-run home run. Marci Seymour also had three hits in three plate appearances. Candise Wise went 2-for-3 with a double and a single. Kayla Cosby pitched a two-hitter in the second game. Cosby was backed up by solo home runs by Erica Jordan and Jordan Olivares. Jordan went 2-for-3, as did Wise, who also stole two bases. The Lady Cardinals had 20 hits in the Grayson doubleheader. Melissa Billingsley and Jordan had three hits each in the Game 1 loss to North Central Texas. Billingsley had two singles, a double and and swiped two bases. Jordan had a triple to go along with two singles. She drove in three runs. In the second game, Jazmine Hicks and Jordan both went 2-for-4 to lead the plate attack. Chyna Phipps also had two hits and stole two bases. The Lady Cardinals are scheduled to return to action in their home opener Wednesday against Hill College. Doubleheader action at Cain Park begins at 1 p.m. The Cardinals jumped out to a 16-4 lead and then held off Bossier Parish for an 80-69 win Saturday afternoon at Cardinal Gym. With the score tied at 28-28 with 3:51 to go in the first half, the Cardinals held Bossier Parish scoreless to lead 35-28 at halftime. The Cardinals scored nine unanswered points to start the second half to take control of the game. Octavius Ellis, who scored eight of the Cardinals’ first 10 points in the first three minutes of the game, finished with 24 points. Carl Porter also scored in double figures with 18 points. Karon Phillips and Jhaustin Thomas netted eight each. The win boosted the Cardinals’ season record to 15-8. They are 6-6 in conference play. 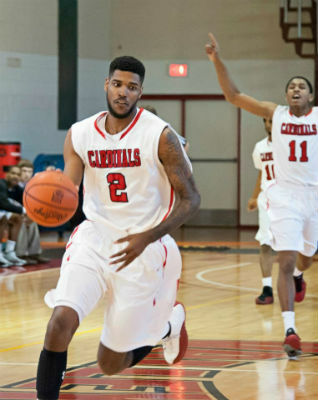 The Cardinals are scheduled to return to action Wednesday on the road against Navarro. Game time in Corsicana is 7 p.m. The third-ranked Lady Cardinals went on the road Saturday to take care of business, rolling to an 80-46 win against San Jacinto. The Lady Cardinals had the game in hand at the half, leading 41-19. Adut Bulgak and Shlonte’ Allen fired in 19 points each to lead the Lady Cardinals. Also scoring in double figures were Savannah Carter with 13 and Shannon Smith with 11. The win improved the Lady Cardinals to 22-1 overall and 9-0 in conference play. 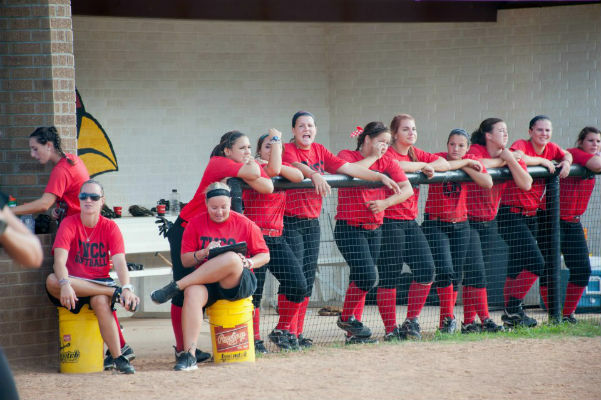 The Lady Cardinals are scheduled to be back in action on the road Wednesday against Angelina. Tipoff in Lufkin is set for 5:30 p.m.